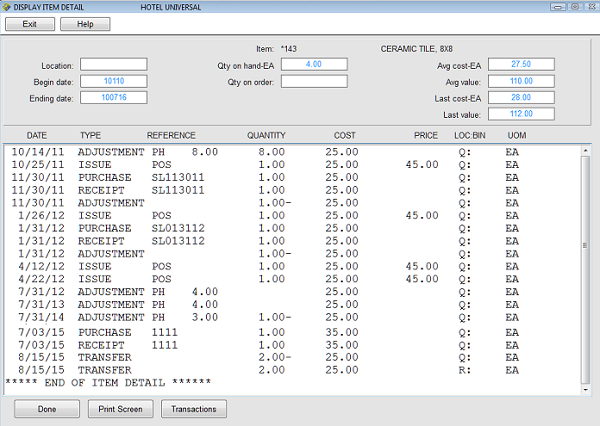 To view item detail (transaction history), to go Inventory Processing then select #6, Item detail display. At the prompt enter the item code select Look-up if you don't know the item code. At the next prompts, enter the location or press Enter to view all locations. 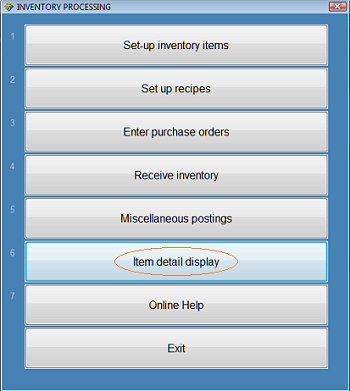 Note that if you specify the location only items in that location will display and your total inventory count will not reflect the total for that time. Next enter the beginning date and ending dates. Below are step by step images followed by an explanation of the displayed information. Here is an explanation of the information displayed at the top of the screen. Here is an explanation of the transaction types. Displayed is a list of various types of transactions. Note that you cannot simply add everything in the "Quantity" column to get the quantity on hand. ISSUE - shows both issues from POS sales and issues from Miscellaneous Postings . 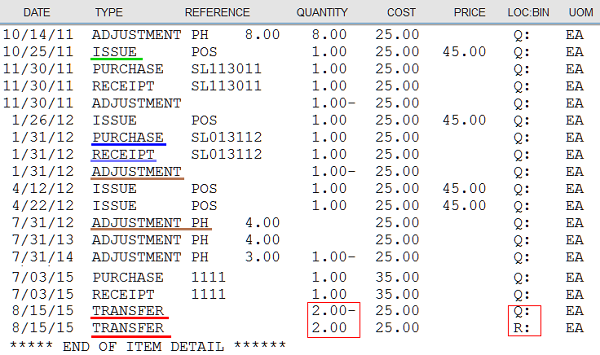 PURCHASE and RECEIPT - PURCHASE shows purchase orders and RECEIPT shows purchase order receipts. ADJUSTMENT - shows two types of adjustments: physical inventory (done via Physical Inventory) and adjustments via Miscellaneous Postings. TRANSFER - shows two lines, one in the FROM location and one in the TO location for transfers done via Miscellaneous Postings.